National debt can be measured by a number of methods. The IMF counts general government debt as the national debt. At the end of 2017, the organization calculated the gross national debt of the Netherlands as 56.7% of the country’s GDP. That figure adds up all of the debt that the national government owed. Net debt deducts the financial assets held by a government from the gross debt figure. The IMF’s net national debt estimate for the Netherlands was 46.2% of GDP at the end of 2017. 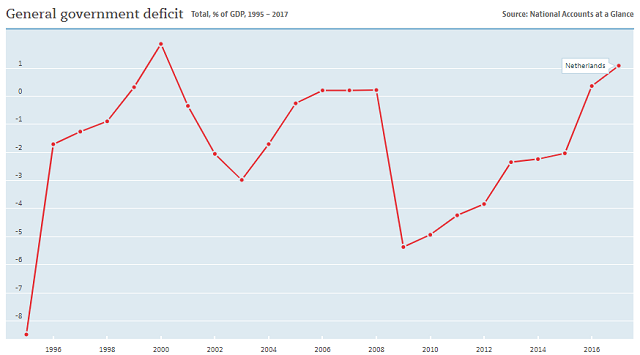 Under the Maastricht Treaty, the government of the Netherlands is bound to keep its annual budget deficit under 3% of GDP and bring the country’s national debt down to 60% of GDP. After ratifying that treaty, the Dutch government did very well at getting the country’s national debt down. However, the country was hit hard by the 2008 financial crisis and the continuing repercussions of government debt throughout Europe have made it difficult for the government to fulfill its obligations and keep debt down. 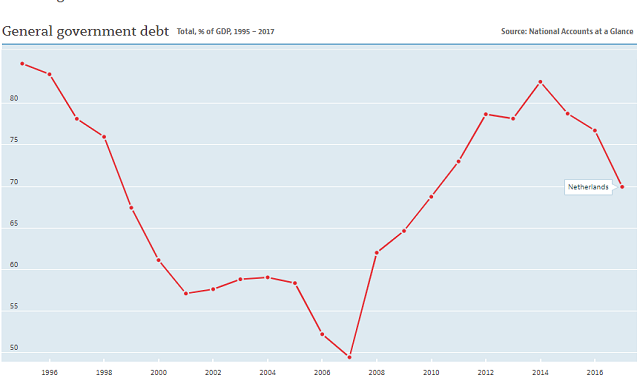 The chart below from the OECD shows the impact that the banking crisis in 2008 had on the national debt of the Netherlands. The nations’ finance was hit hard by the collapse of ABN-Amro, one of the world’s major banks. A simultaneous burst in a property price bubble in the country created a raft of non-performing loans that weighed down the economy further because it caused a credit squeeze. In order to pump liquidity into the economy, the government had to take on more debt itself, which is clear to see in the debt to GDP graph. The government adopted a policy of maintaining a large annual budget deficit in order to keep the economy expanding. This policy can be seen very clearly in the chart below. The government intentionally increased its debt year by year, decreasing the budget deficit every year as a proportion of the national income (GDP). The goal of returning to a balanced budget was finally achieved in 2016. That task of starting to reduce deficits and try to bring down the national debt was made easier by the expanding Dutch economy. 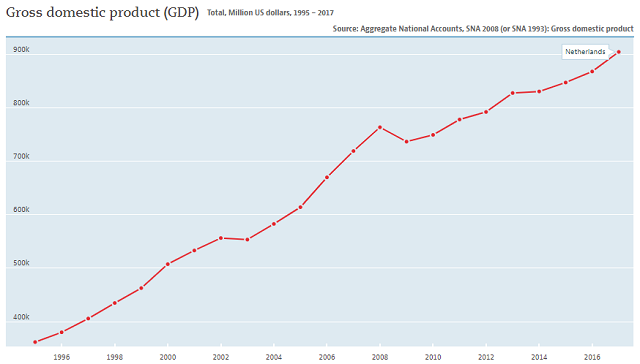 After a fall in 2008, the GDP of the Netherlands has grown consistently, as is shown in the graph below. The growth in GDP has also lifted house prices back up above the levels of the mortgages that homeowners took out on them. So, by growing the national economy, the government has managed to fix most of the public sector debt problems that were caused by negative equity. The success of this campaign means that the government of the Netherlands can now start to run budget surpluses and pay down the national debt. With an expanding GDP, the payments that the government makes to pay down the national debt in absolute figures will reflect as an even sharper fall in the debt to GDP figures. Who manages the Netherlands’ national debt? The government of the Kingdom of the Netherlands is responsible for managing the economy and that includes the national debt. The government department that is directly in charge of the debt is the Ministry of Finance. The Ministry gives the responsibility of managing the national debt to Agentschap van het ministerie van Financiën, that is, the Dutch State Treasury Agency (DSTA). How does the Dutch government raise loans? The DSTA uses a number of methods to raise debt. The position of the Dutch national debt at the end of 2018 by debt type is shown in the table below. Treasury bills are a type of instrument that is commonly used by all governments for short-term financing. These securities are tradeable on the secondary money market. A DTC is never issued with a maturity of more than one year. The DTC does not pay any interest. However, the bills are sold at a discount and redeemed at full face value. Although “DSL” stands for “Dutch State Loans,” this form of debt is not created through bank loans — the DSTA takes out bank loans as well. The DST is a bond. These bonds pay a fixed rate of interest for their lifetimes. A DST has a maturity period of more than a year. These securities are also tradeable. The DSTA does not sell either bonds or Treasury bills directly onto the open market. The Agency has compiled a list of authorized buyers, who are the Primary Dealers. When a new issue of securities is released, only the primary dealers are allowed to buy them directly from the DSTA. Those dealers then sell on their allocations by placing them for sale on the secondary markets. At this point, anyone else is allowed to buy the securities. What facts should you know about Netherlands' national debt? You could wrap $1 bills around the Earth 2,051 times with the debt amount. If you lay $1 bills on top of each other they would make a pile 57,535 km, or 35,751 miles high.